In 1905, John Stuart Mill’s step daughter Helen Taylor, left what remained of her step-father’s library (c 2,000 volumes) to Somerville College to be used by undergraduates in their studies. For the next sixty years, the collection was on open shelves for the use of students and it was not until the 1960s that it was decided to gather all JSM’s books together in a closed collection. The books reflect his varied interests and range in subject from political theory through literature to natural science and mathematics. Many of the books belonged to JSM’s father, the political writer James Mill, and contain annotations from both men. A project was carried out by Robert Fenn in the 1980s to identify books with marginalia. Though never published, his notes are available for consultation in the library. The books are not catalogued on the University union catalogue SOLO, but are listed here: JS Mill Library (pdf 208 kb). Visitors wishing to consult the library for research purposes should make an appointment with the Librarian . Amelia Edwards (1831-1892) was a writer, traveller and Egyptologist whose passion for Egypt (reflected in her best-selling book A Thousand Miles Up the Nile ) sparked an interest in all things Egyptian in England in the late nineteenth Century. Thanks largely to her efforts, the Egypt Exploration Society was set up in 1882 to promote and regularise the excavations of tombs in Egypt. A supporter of education for women, she left her books, papers and watercolours to Somerville along with a small collection of Greek and Roman pots. The books are not catalogued on the University union catalogue SOLO but a finding aid of her papers is available : ABE Catalogue. Her watercolours are not on permanent display but may be viewed for research purposes by appointment with the librarian. Withers (1867-1945) was a doctor and occasional writer, who accumulated a circle of illustrious friends during the course of his life, including AE Housman, Max Beerbohm, Paul Nash, Lascelles Abercrombie, Gordon Bottomley, Walter de la Mare and Robert Bridges. The Somerville collection includes photographs, letters, drawings and poems from these men and was presented to Somerville by his daughters Audrey and Monica (who were both alumnae of Somerville, as was Percy’s wife Mary). The collection has a finding aid: Percy Withers Collection (pdf 444kb) and the papers may be consulted for research purposes by appointment with the librarian. Vera Brittain (1893-1970), the writer, pacifist and feminist, is perhaps most famous as the ‘voice of the Lost Generation’ of World War One through her autobiographical work Testament of Youth – one of the first accounts of the Great War from a woman’s point of view, and undoubtedly the most influential. 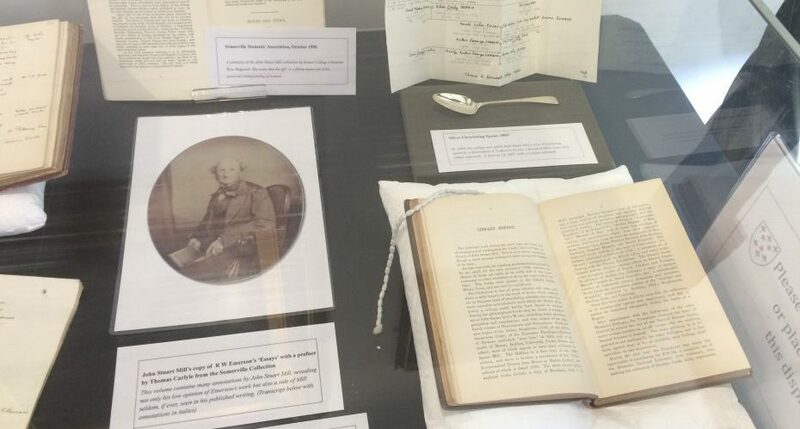 The collection at Somerville consists of a number of her letters and a large amount of research material used in writing her biography, and were given to Somerville Library by her biographers Mark Bostridge and Paul Berry. A summary of the holdings is available : Vera Brittain- Paul Berry Index Brittain Collection index (pdf 16kb). The papers are now housed in the Vera Brittain Room in the College archives. Margaret Kennedy (1896-1967) was a British novelist and playwright. She attended Somerville College in the years 1915 to 1918, studying modern history. She began her career as a writer with the historical work A Century of Revolution (1922), yet it was her best-selling novel, The Constant Nymph, which catapulted her to fame in 1924. It was later dramatized, with Noël Coward in the lead role. Muriel St Clare Byrne (1895-1983) was a prominent historian and researcher who specialised in the Tudor period. She attended Somerville College from 1914 – 1917 and studied English. She later became an assistant tutor in English at the College in 1919, and graduated with an M.A. in 1920. Afterwards, she lectured in London on Elizabethan theatre, becoming a governor of the Royal Shakespeare Theatre. In 1937, she collaborated with an old friend and Somerville contemporary, Dorothy Leigh Sayers, in writing the play Busman’s Honeymoon. Her most notable work, however, was The Lisle Letters a collection of and commentary on the correspondence of Arthur Plantagenet. It took her 50 years to produce the six volumes, which were eventually published in 1981 on her 86th birthday. Somerville College has a collection of her papers, correspondence and photographs which are listed here: Muriel StClare Byrne collection (pdf 129kb). Please note: access to these collections is currently restricted though queries from interested parties are welcome.